Indicators refer to various types of instrument gauges employed to surgically asses diminutive distances and angles, amplifying them to make them more obvious (Source). As the name implies, they provide an 'indication' to the user's naked and undiscerning eye that which they can't see. When it comes to choosing between horizontal or vertical dial test indicators, one buyer we interviewed told us that the difference comes down to how the dial meter is mounted and how it functions. Specifically, with horizontal test indicators, they provide measurements using level arms, while the vertical test indicators provide measurements with a plunger (Source). 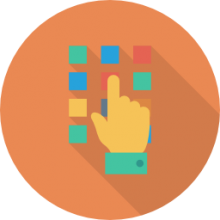 The difference between test indicators and dial indicators is that test indicators use lever-type contacts, while dial indicators employ plunger-type contacts (Source). As well, test indicators are generally lighter-weight and smaller dial indicators. They do have overlapping uses, but are often employed for separate tasks (Source). Dial indicators are best for comparative & repetitive measurements. When it's mounted in a fixture gage, its straight, vertical motion makes sure that relative to the fixture, the contact always lands in the same place (Source). Test indicators, on the other hand, are best employed to gather consistency measurements, instead of comparative ones. Indeed, they are most frequently deployed to to interpret relatively broad part surfaces, oftentimes 1 or 2 dimensions. An example would be assessing height, flatness, or roundness variations (Source). Mitutoyo is a highly regarded brand name, generally considered the industry standard. It's often employed as an "intermediate" range indicator, mainly to tram in CNC fixture alignments for vehicles. It's important to keep in mind that these are fragile, sensitive tools. If you use them in rough industries, don't be surprised if they break. However, the Mitutoyo indicators generally stand up better to workplace abuse than the other options. This dial test indicator offered by Mitutoyo is an effective option for someone who needs pretty much an industry standard. Users love the accuracy and quality of this test indicator, but some have complaints about the choice of anti-magnetic material. 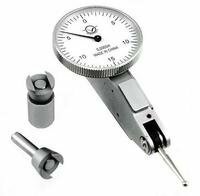 This product is a horizontal dial test indicator with .0005″ graduations, .030″ range and 0-15-0 dial face. It features .079″ carbide contact point, 3/8″ stem and a clamp nut. It comes in a fitted plastic case. This dial test indicator seems like a good choice if you are looking for a general purpose indicator. The general user consensus concerning the Mitutoyo test indicator is that it is a decent dial indicator. Buyers agree that you get top-notch quality for a fair price. One satisfied purchaser states that this indicator hasn’t had any problem after 5 years of almost daily use. He continues saying that the Mitutoyo horizontal test indicator passes QS/ISO calibration and inspection standards every year as long as you keep it from being banged around. Another reviewer agreed that the level of accuracy remains high enough to pass industry certification just as well as much more expensive brands. However, one buyer complains about the choice of anti-magnetic material, saying that plastic makes the test indicators too fragile. This dial test indicator offered by TÜRLEN is a good option for someone who needs a test indicator that meets federal specifications for accuracy. Users like that it is a good value for the money, but do complain about inaccuracy and jumpy movements of the needle. This product features easy to read 1-3/16” white face with black markings, 0.0005” graduations per line and automatic reversing. Other features are 7 jewels and durable satin chrome finish. It comes in a padded case. This dial test indicator might be a solid choice if you are looking for a basic test indicator. In general, users have a favorable opinion of the TÜRLEN test indicator, saying that it is a good indicator for the price. Most of the users are satisfied with its accuracy, as long as the nature of the work doesn’t require holding tolerances below .001. However, some buyers complain about inaccuracy. One very dissatisfied buyer shares that the indicator is jumpy and incorrect half the time. Another buyer says that the indicator has about .0003 repeat error sometimes, but doesn’t find it to be a deal-breaker since it’s fine for DIY setups. One dissatisfied purchaser complains about the movement of the needle not being absolutely smooth – it hesitates and then jumps. Another reviewer says that he would prefer it read 0 at 12 o-clock. This dial indicator and magnetic base offered by All Industrial is a solid option for those who need a dial Indicator set. Users love that it’s reliably precise for the price, but some are dissatisfied with the accuracy of the indicators. 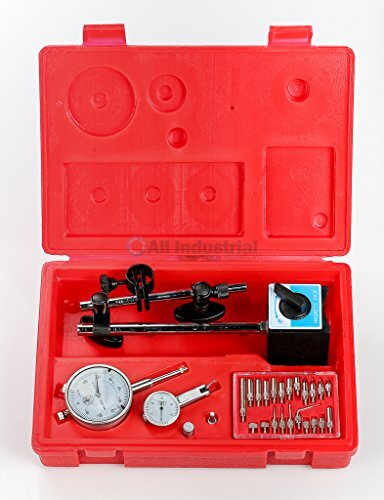 This 4 pieces precision inspection set includes a dial indicator, test indicator, magnetic base and point set inspection tools. It features 1″ dial indicator with 0.001″ graduation and 3/8″ stem diameter, magnetic base with an overall height of 9″, on-off switch and 130 lb. 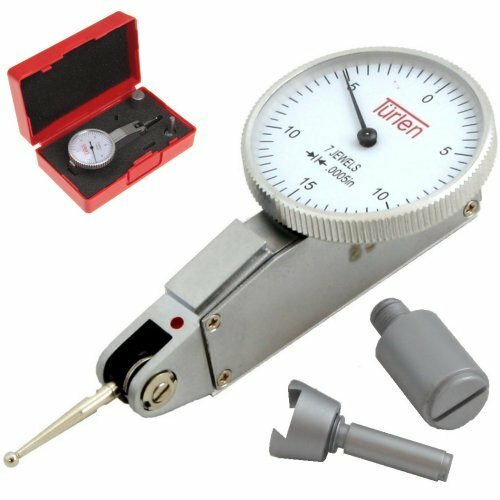 power pull, .030″ dial test indicator with .0005″ graduation and 0-15-0 reading and 22 pieces indicator point set with AGD specifications. If you are looking for a precision inspection kit for jobs where there is a chance that you might break the indicator, this inexpensive kit might be a solid option. In general, users have a favorable opinion of this dial indicator and magnetic base set and they state that it is great value for the money. One purchaser says that this set is accurate to far greater precision than the margin of error on various tools in his home shop. He adds that it is more than sufficiently accurate for woodworking. Another satisfied buyer likes the simplicity of design that makes it robust and also states that it is reliably precise. Moreover, one reviewer shares that both indicators passed calibration inspection in an ISO 9001 shop. However, several purchasers are dissatisfied with the accuracy of the indicator. One of them advises getting multiple readings for better precision. Another dissatisfied purchaser states that the needle on the smaller indicator jumps while measuring. 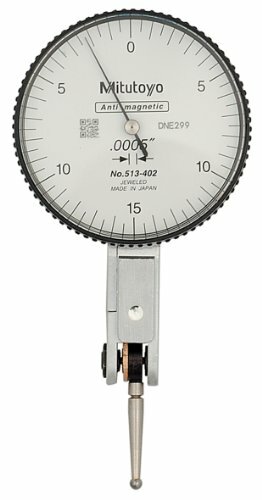 If you are looking for a top-rated dial test indicator, you might want to consider this tool offered by Brown & Sharpe. Users like its performance, but some do complain about the poor quality. This product is a lever type indicator. It features 1.5″ dial diameter, 0.0005″ dial division, 0.030″ range and 0-15-0 marking. This lever type indicator could be a good choice if you are looking for a precision test tool. In general, buyers are satisfied with the Brown & Sharpe test indicator. They say that it’s a good value for the money and works great. However, one buyer complains about the low quality. He says that this is not a good indicator and that you can get one similar for way lower price. If you are looking for a bi-directional lever arm test indicator, you might want to consider this dial test indicator offered by All Industrial. Users love that it is very affordable and reliable, but some do not trust its accuracy and repeatability. This product features easy to read 1-1/4″ dial and automatic reversing contact point for always-clockwise hand rotation. Other features are durable satin chrome finish, non-yellowing crystal and fluted bezel for non-slip grip. It has gradations in 0.0005″ and .030″ range. The indicator reads 0-15-0. If you are looking for an inexpensive dial test indicator, this might be a solid option. In general, users have a favorable opinion of this All Industrial dial test indicator, and they praise its affordability. One user states that this tool is a money saver since he could have spent many times more money and been no happier. Another satisfied purchaser says that this indicator has been very accurate. However, some buyers don’t trust the accuracy and repeatability of this tool. One buyer complains about very poor quality in the internal working mechanism and wouldn’t recommend buying this item. The first dial test indicator we examined is the Mitutoyo horizontal test indicator. It has graduations of .0005 inches with a range of .03 inches. Many buyers were torn between purchasing a vertical or a horizontal option, particularly for automotive uses like inspecting brake rotors. Some buyers prefer vertical options because their magnetic base makes it easier to mount them. Reviewers were satisfied with the dovetail mounts on its back and bottom. One satisfied technician told us that this particular horizontal test indicator is the industry standard- manufactured by a renowned brand at a decent price. They tell us that the included dovetail was pretty simple to tighten, employing a knurled nut. Another service technician explained to us that it has mostly functioned as an intermediate range indicator, for his purposes, particularly helpful for automotive circumstances for traming fixture alignments. It's important to recognize that these are highly precise and very delicate instruments, so if you work in a rugged industry, it's likely that you will damage them over time, though this particular option has proved more rugged than most with an ability to maintain a high degree of accuracy throughout extended use. The second dial test indicator we examined was the Turlen- it features a white face with black markings, graduations of .0005 inches per line, a satin chrome finish and ships with a padded storage case. Some buyers were somewhat confused by the manufacturers denoting 7 jewels in the product description. Buyers tell us that it refers to the fact that some of the interior rotating parts are constructed from superhard jewels as opposed to plastic or bronze. One automotive technician told us that this is probably a Chinese-made test indicator that while not incredibly high-quality is a functional option. Another reviewer was pleasantly surprised, saying that it is accurate with a highly sensitive trigger that ships in a hinged plastic break case that has a sponge-like interior to ensure that the test dial indicator is compactly and securely contained during storage and transportation. However, another reviewer disagrees, saying that it is a solid option, but certainly not a high-functioning dial indicator. He does endorse the included dovetail posts that are machined well, but he is somewhat annoyed that it doesn't read zero at 12 o'clock. Another reviewer settles the debate, saying that if you want to buy something really expensive and get quality, that's what you should do- but this option was satisfactory for his various technical uses, mainly as a hobbyist he is interested in calibrating a vice jaw. The third dial test indicator kit we examined is manufactured by All Industrial- it ships with a magnetic base, an indicator point set, dial test indicator and a dial indicator. Importantly, the test indicator is dovetailed. One high-end automotive mechanic told us that it was a solid option to work on differential gears- well-priced with a strong magnet that resisted breaking down after getting grimed with dirt, oil, and grease. Another home hobbyist endorsed it as a means of assessing his lathe and milling equipment- saying that he wouldn't endorse it as a tool for highly precise work like manufacturing surgical tools or aircraft parts, but a solid option for home use. The fourth option we examined was the Brown & Sharpe dial, lever-type indicator. One buyer endorsed it as a solid value by- another Chinese-manufactured product that he uses as a spare whenever not employing his higher-end indicators. The last dial test indicator we examined is the All industrial (non-kit) option with a bi-directional lever arm. It is advertised as an indispensable tool for machinists with an easy-to-read dial, an automated reversing contact point, dovetail mounts and an included foam-insulated plastic storage case. One freelance machinist told us that it is an incredibly inexpensive option, perhaps best used as a disposable back up. While one reviewer wishes the dovetails could be a bit smoother for an enhanced holder fit, most felt the test readings were accurate and endorse it as a money-saving, cheap option.